This has been a rough winter for many parts of the United States. Even as we reach the tail end of the season, the northeast is being pummeled with another huge snow storm that has grounded flights and made many roads impassable. Anyone who has lived in a place that regularly gets snow knows the drill. When a storm is predicted, city trucks will drive down the main streets and highways pouring huge quantities of industrial salt on the roads to melt the snow and keep the roads passable. More salt is applied after the snow hits. Salting streets helps communities continue to function even during bad weather. It lets workers get to the office and ambulances help people in need. It’s worth asking though, where does all this salt go? In many cases, it will flow into the local waterways along with snow melt. Large quantities of salt can change the salinity of bodies of water, which can have an effect on the plants, wildlife, and even humans who drink from it. At Pathfinder Instruments, we provide a wide range of instruments and parts that allow researchers and professionals to monitor the salinity of water sources. These include our Pathfinder HPT-12 Resistivity Transmitter. 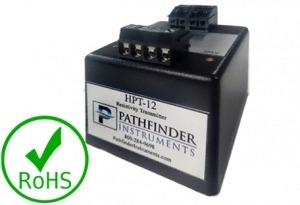 Contact us today to learn more about the Pathfinder HPT-12 Resistivity Transmitter.